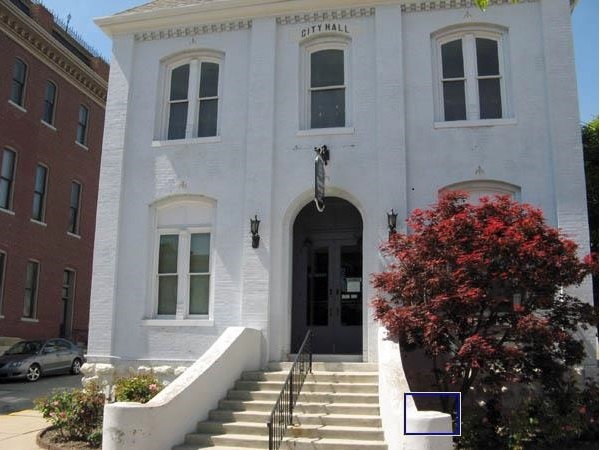 The building that currently serves as the Headquarters and Archives of the St. Charles County Historical Society is located at 101 South Main Street, St. Charles, Missouri. This structure, the second on that site, dates from 1886. The original building was the old “Market and Fish House” which was erected in 1823. During the period the Missouri State Capitol was located in St. Charles (1821-1826), William G. Pettus, Secretary of State for the State of Missouri, saw a need for a public market. He envisioned a market place where farmers and fishermen of the County could sell their food items to other residents. In the March 13, 1822 newspaper, The Missourian, a notice was printed requesting proposals be submitted by April 15, 1822, for building a market house and for a piece of ground upon which the building would be constructed. On March 28, 1823, William G. and Caroline R. Pettus purchased the lot on Main and Jefferson Streets from Antoine Reynal, the property’s owner since 1800. Monsieur Reynal was the owner of the St. Charles Fur Trading Company. Later that year, a two-story building with a basement was built and opened as the Market and Fish House. The Market and Fish House contained stalls for produce, an in-ground scale in the front of the building to weigh wagon loads of goods, outside oil lamps, a large public bulletin board to post public and private notices, and wooden benches around the building. It was open Monday through Saturday, and closed on Sunday. After a wagon load of goods was weighed, it would go to the back of the building and items would be sold from the wagon or unloaded and marketed. The Market and Fish House proved to be a popular and successful business venture. During the early years of the building, the town band played on the Market steps once a week to entertain those who sat on the benches surrounding the building. While waiting for the mail coach to arrive at the Post Office located at 318 South Main Street, people would rest on the these benches and listen to the band. It would cease playing as the coach passed by so that people could run down the street to pick up their mail. On December 18, 1832, St. Charles County purchased the Market and Fish House. The County added additional booths contained in a one-story addition at its rear and started to charge a fee for its use. They also began allowing women to sell “handwork” from special stalls. Approximately three months after the County purchased the Market and Fish House, the County sold it to the City of St. Charles on March 21, 1833. The hurricane (aka tornado) of February 26, 1876, blew the roof off the building. On March 1, 1876, a new roof of a mansard style was erected. The building continued to be used as the Market and Fish House until 1886, a total of 63 years. In 1886, the original building was torn down and rebuilt after several proposals for renovation were rejected by the City Council. The new building was expanded approximately 20 feet to the east, windows were added to the front of the building, the booths were torn out, and other changes made to convert the building into a city hall for St. Charles. A cornerstone was placed in the right front corner of the building addition indicating the conversion of the building from a market place to the City Hall. A time capsule placed in a nook beneath the cornerstone was retrieved in 2010. The contents were found to be in reasonable condition and offered further insight into events surrounding the reconstruction. The building was used as the City Hall for the next 87 years until 1973. By 1973, the building could no longer handle the needs of the City and a new City Hall was built at 200 North Second Street and a new police station on West Clay Street. The police station has since relocated from West Clay Street to Zumbehl Road. 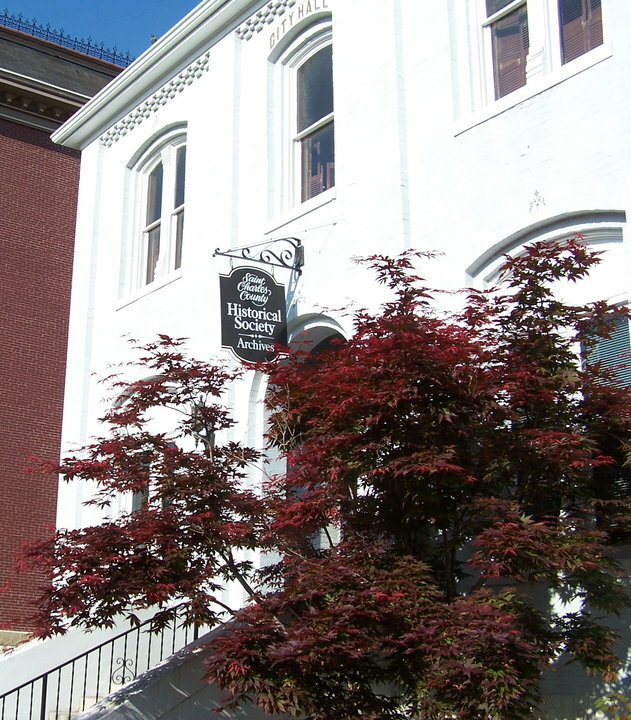 In 1982, the St. Charles County Historical Society was able to lease the building from the City. It continues to serve as the Headquarters and Archives of the Society at 101 South Main in St. Charles. R. Goebel postcard showing “The Last City Market House, 1885” to the right. R. Goebel postcard showing the St. Charles City Hall to the right. J. Gossler postcard of the St. Charles City Hall. C. E. Meyer Druggist postcard of the St. Charles City Hall to the right. Photo of the Headquarters and Archives of Saint Charles County Historical Society. 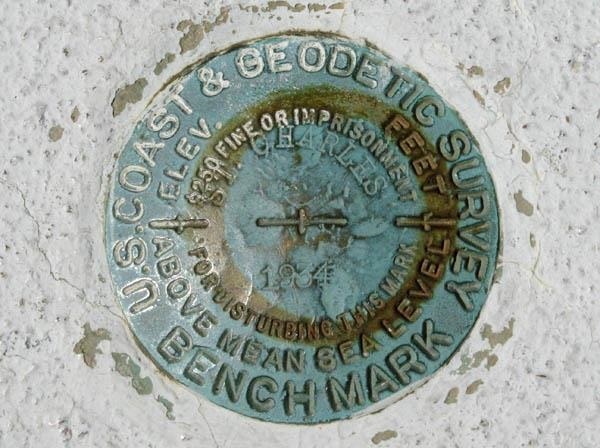 For those interested in geocaching and benchmark data, here is some additional information.